Figure 1. Ecoregions of Oregon. The numerals indicate the number of plant taxa whose distribution is limited to that ecoregion. (Adapted from: Meyers, S.C., Jaster, T., Mitchell, K.E., & Hardison, L.K. (Eds.). (2015). Flora of Oregon. Volume 1: Pteridophytes, gymnosperms, and monocots. Fort Worth, TX: Botanical Research Institute of Texas. I recently overheard the lament of a gardener frustrated by his most recent, unsuccessful attempt at planting native species. “Natives — they just won’t grow here!” he bemoaned. The irony of the statement brought a momentary smile to my face. But when efforts to include natives in the landscape fizzle, it is no laughing matter. Natives do grow here: they are, after all, superbly adapted to live in the place of their origin. Providing information on the ways native plants are unique in the garden world can lead to new insights about this expanding class of plant materials, and bring success and satisfaction to the native plant gardener. What makes a plant species (taxon) native? Time and place are the keys to grasping the definition. The Oregon Flora Project calls a taxon native if, based on the information available, it was part of the natural landscape before European settlement. This provides a useable, working definition representing the perspective of settlers of the western United States. The area under consideration also plays an important role in determining which species are deemed native. It can encompass large places, such as the North American continent, or much smaller regions, such as a state or mountain range. Ecoregions make very useful boundaries for considering nativity: an ecoregion is defined by its climate, soils and geology as well as the communities of plants and animals that have adapted to live there. 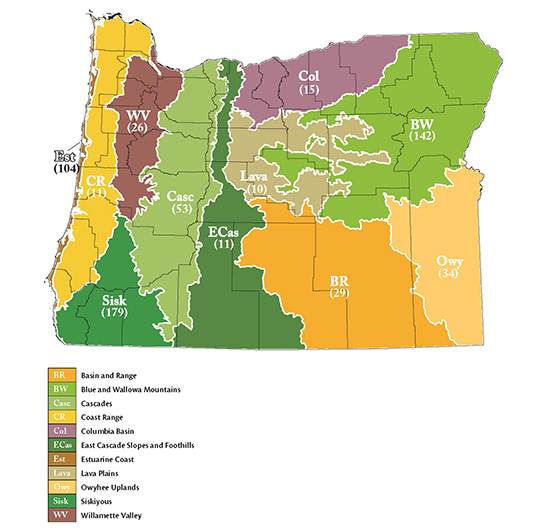 Oregon has 11 ecoregions, and each has plant species that are found uniquely within its area, in addition to many taxa that occur throughout the state and beyond (Figure 1). There are many benefits the native plant gardener enjoys when selecting species that naturally occur in a particular ecoregion. Foremost, native plants are well adapted to their environment, and once established, they typically require less maintenance, water, fertilizer and pesticides. For example, Willamette Valley species thrive in soggy winters and dry summers, and do not suffer from lack of summer watering compared to many non-native plantings. Furthermore, native species are in ecological balance, meaning that the plants and their naturally occurring pests and pathogens have co-evolved, bringing with them a series of checks and balances to keep both elements in control. Planting natives supports the entire web of native organisms, from all-important pollinators and beneficial insects, to birds, amphibians and mammals. In addition to the ecological role that natives play in gardens and landscapes, they also anchor us in the uniqueness of the place we call home. Whether it’s a planting in La Grande using lomatiums and lupines, or a Portland front yard boasting camas and columbines, appropriate native species affirm our place in the state and the world. Reliable sources of information about the naturally occurring plants of an area are valuable tools for the horticulturalist. Floras have traditionally been the scientific source for descriptions and distributions of a region’s plants. A flora is a detailed reference that describes each plant taxon, includes identification tools and provides spatial context for that information. The Oregon Flora Project is producing a flora for our state — the first such resource in 55 years. Volume 1 of the three-volume Flora of Oregon, published last year, is currently available. It includes the ferns, conifers and monocots (lilies, grasses, orchids, etc. ), which comprise approximately 23 percent of the state’s native and naturalized plant taxa. The dicots — a diverse classification of herbs, shrubs and trees — will be treated in the subsequent two volumes. Volume 2, scheduled for publication in 2018, will showcase illustrated chapters about plant-insect interactions and gardening with natives. Notable plant groups treated in this volume include the carrot, sunflower, mustard and legume families. A first glance through a flora may give the impression that its thousands of details are best reserved for scholarly researchers. However, those details — such as plant height, leaf shape, flowering time, and habitats and ecoregions where species grow — are facts that can help gardeners and landscapers make informed decisions about how plants will behave in a cultivated setting. The taxonomic organization of the Flora of Oregon details what species and genera a plant is related to. Coupled with the physical and ecological characteristics of each taxon, the flora is a treasure trove of information for horticulturalists looking for new species to cultivate. The website of the Oregon Flora Project (www.oregonflora.org) is another excellent resource for learning about the plants of our state. The Oregon Plant Atlas (www.oregonflora.org/atlas.php) is an interactive plant-mapping program that allows users to see the distribution of any plant species growing in the state. When a plant’s distribution is shown, it is also possible to see a list of other plants observed at a site (if the plant collector reported them). These listings of plant communities found in nature are a good source of ideas for companion plantings in a garden. One of the most popular links among gardeners on the Oregon Flora Project website is the Photo Gallery (www.oregonflora.org/gallery.php), which contains 39,970 images of Oregon plants growing in the wild. Pictures — with confirmed identifications — are available for 95 percent of Oregon’s 4,647 different plant species, making it a valuable resource for learning what any given plant will look like in its native habitat. One challenge that gardeners face is a lack of ready information on where to purchase native plant material. The Oregon Flora Project’s gardening webpage (www.oregonflora.org/gardening.php) lists 587 native plant species that are commercially available through wholesalers and retailers. Currently, 28 nurseries are listed, and sources are continually being added. A gardening portal is currently being constructed that will enable users to select from more than 25 plant features including light and water regimes, landscape uses, plant size, flowering time and commercial availability to identify which native plants will fill their gardening needs. This will be a part of the completely redesigned oregonflora.org website, to be launched in spring 2017. The Oregon Flora Project is a key resource for learning about native plants, from their growth habits and flower color to their naturally occurring habitats. It also provides information that can help retailers and gardeners reap the benefits of including natives in their plant palettes. Natives: they do grow well here!